1) The reverse of Pisanello’s medal of Pier Candido Decembrio presents the image of a book, which is elevated on an altar-like rock and shows a number of bookmarks dangling from its pages. 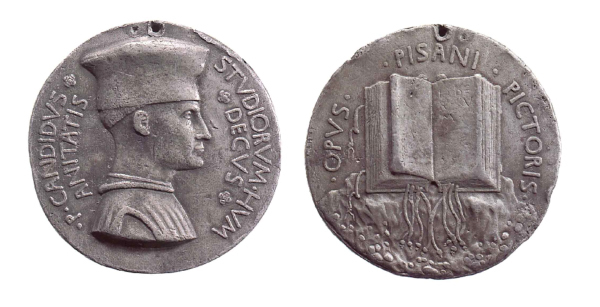 Based on the discussion of books in this unit, suggest ideas about the meaning of the image and why Decembrio might have chosen it for the reverse of his portrait medal. 2) As Alberti and other Renaissance intellectuals knew, visual artifacts were important transmitters of complex ideas. Based on that notion, what are some of the reasons a Renaissance collector such as Marcantonio Michiel (discussed in the unit essay) would be interested in restoring fragmentary antique pieces? 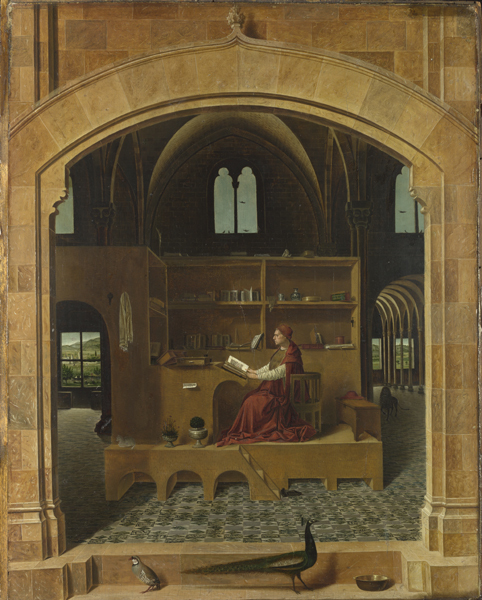 3) This carefully constructed painting shows an image of an ecclesiastic who presents himself as Saint Jerome. Describe the setting and the objects included. What evidence is there to be found in the painting to indicate that the individual depicted is a religious figure and not a secular scholar? What are some possible reasons the patron would want himself to be depicted as Saint Jerome? 4) In the Renaissance, as discussed in the unit essay, individuals associated themselves with books as a way of demonstrating their learning and status. What are some of the objects with which men and women of today associate themselves to indicate their special qualities?